Whether you’re a freelancer on the hunt for new gigs, or an employer who wants to select the best contractors, you’ve surely stumbled upon the concept of a freelancing skills test. They have become popular in recent years. More companies are working with freelancers and are looking for the best ways to assess candidates’ knowledge and skill set. After all, in 2016, freelancers made up 35% of the U.S. workforce, according to Forbes. This amounts to more than 53 million people who contribute about $715 billion to the economy. For independent professionals, a freelancing skills test is one of the methods for proving their expertise in their key area. A number of freelancing and training websites offer targeted tests, which can be later on presented to potential employers. They can be of great value to freelancers who want to expand their work options by showcasing their skill set. On the flip side, these tests may not be the most accurate way to measure the capabilities of people. Many companies require test scores before hiring external contractors, but they usually consider a number of other factors. Employers typically take into account relevant previous experience. They also look at the candidate’s portfolio, as well as the level of soft skills such as communication skills. While tests can guide a hiring decision, it is rarely the deal maker or breaker. So, how important are freelancing skills tests for both freelancers and employers? Let’s dig into the ways that a professional can prove their suitability for a job, and the methods that a business can use to discern the right candidate. Skills tests come in different shapes, but in essence, their goal is to assess a freelancer’s ability to handle issues in a well-defined expertise area. Professionals can take independent tests, such as those provided by MindTools and BrainBench. Then they can include the respective certifications in their resumes and portfolios. Most often, freelancers take skills tests within job platforms. The majority of websites offer their own set of tests. They cover pre-defined knowledge areas such as specific software programs for IT specialists, or language proficiency for translators and writers. Once a freelancer successfully completes a test, they can place the certification in their profile on the respective platform. They may also be able to add certifications they have earned outside of the website. In some cases, if professionals want to apply for a job, they may have to take tests required by the employer for the specific position. The form of the tests is typically a set of questions. Freelancers have to solve them by selecting the right answer among about four-to-five options. The score is calculated on the basis of the number of correct answers against the number of questions in total. For most websites, a passing score is above 50%. This means that professionals should choose at least half of the correct answers. However, employers who take into account a freelancing skills test would often look for higher scores. That’s why freelancers typically aim for scores above 80%. While a freelancing skills test can be a great way to assess a candidate, it can be tricky to base a hiring judgment on online measurements only. For many freelancing platforms, the questions and their answers have been leaked and can be accessed via a simple Google search. Even if candidates don’t use the cheat sheets, employers can never be sure if the individual has taken the test themselves, or has used help from another person or from other resources. What do freelancers and businesses say about freelancing skills tests? Here is what people shared on Reddit and Quora. Both sides have a point – there is a level of usefulness and a level of uncertainty that come with a freelancing skills test. They can, however, be used as a guide for the standing of a candidate. But to gain real depth, it’s a good idea for both freelancers and businesses to consider additional forms of showcasing and testing skills. As just illustrated, it’s beyond doubt that a freelancing skills test can be useful for both professionals and employers. But they may not always uncover all the skills and knowledge aspects that a candidate can offer. What else can freelancers do to showcase their competencies so that employers get a full picture of them? Whether it’s a graphic designer, a tech specialist, or a financial consultant, everybody needs a representative portfolio. For professionals looking for new opportunities, one of the best ways to build up their profile and improve their earning power is to pay special attention to their portfolios. What exactly does a solid and eye-catching portfolio contain? First and foremost, it answers the question “Who is this person?” A prospective employer can learn not only about the candidate’s portfolio, but also the kind of work the person enjoys doing. They can also learn how they go about doing it, and what their future plans are. Previous projects are, of course, essential. The portfolio is the place where freelancers can include their success stories and showcase their best work. The more detailed these samples are, the more a client can judge the quality and ethics of that professional. It’s also important to include references and testimonials. These additions can give first-hand information about the experience of working with a freelancer. 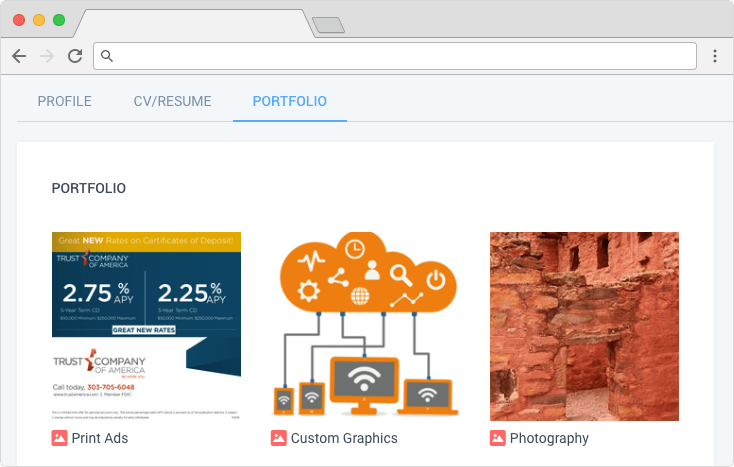 When done, freelancers should include their portfolios in their online profiles. With Hubstaff Talent, independent professionals can showcase their skills and advertise their portfolios for free. Freelancers can request, and employers can offer too, a testing task during the interviewing period. This is the most suitable step after the initial meeting, in which the client has established the suitability of a candidate. In most cases, the client pays for the testing period. This is especially important for larger projects, which would require a considerable time investment. The tasks should be as close to the actual work required as possible. In this way, freelancers can try out whether the type of projects fits their know-how and skills. They can make an assessment of the time they need to execute certain tasks, and thus, can better adjust their pricing models. At the same time, test projects allow employers to judge the suitability of candidates in an immediate way. The check is done with a practical example rather than percentages earned in exams, or resumes of previous education and experience. A client can test a freelancer’s suitability and skill set in additional ways. The employer can offer a trial period, during which the methods and productivity of the professional can be tested in an evidence-based way with the help of employee monitoring software. It takes random screenshots of a user’s active applications and calculates their activity level on the basis of mouse and keyboard actions. By using this monitoring feature, businesses can check whether a freelancer is truly up to the challenge. At the same time, contractors can prove that they possess all necessary skills required for the job. As for the time tracking functionality, by employing it, clients can be sure that they are paying only the hours that the freelancer has worked on their project. It’s easy to set up employee time tracking when hiring freelancers via Hubstaff Talent, as the feature is fee-free just like the rest of the platform’s services. Logging hours is also useful for contractors, as they can easily ensure that they are receiving a fair remuneration for the efforts they’re investing. A freelancing skills test can be of great value in your hiring process, or for enriching your profile as a freelancer. However, they are definitely not the only way for proving the suitability of a candidate for a job. There are many other – both creative and practical – ways that can provide a more complete picture. What’s yours? We’d love to learn more about it in the comments below!